We are able to provide a wide variety of Metallic Gasket to the vast industrial base. 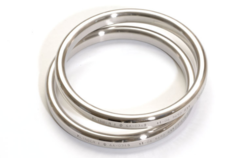 These Metallic Gaskets that we offer are especially used for filling the gap between any two mating body so that the leaking could be prevented. Besides, these Metallic Gaskets are robustly constructed and easy to maintain. Krishna Mining Tools Pvt. Ltd.
We are manufacturer and exporter of Metal Jacked Gasket. These are available in a wide range of materials. These gaskets may be supplied as double jacketed or single jacketed. We offer these at reasonable rates. Packings And Jointings Gaskets Pvt. Ltd.
Our organization is engaged in offering of Metallic Gaskets and attained a lot in the short span of time. These Metallic Gaskets manufactured by us are of latest technology as we have our strong believe in quality manufacturing. These Gaskets are made by sandwiching Asbestos/ NonAsbestos material with Copper/Steel Layers. The area of application of these Gaskets are for Cylinder Head, Inlet & Exhaust manifolds in Automobile and Stationary engines.